It all started on quiet Tuesday when I was chatting with varun reddy, my friend from L, on the phone when he told me about an article he had recently written for a magazine. I instantly got interested, and asked him the details to which he enthusiastically obliged. About two weeks from that, he was in Bangalore for a short trip, and we again spoke about the article. I then expressed my interest in contributing for the same. Varun referred me to the contact in the magazine, and lo! 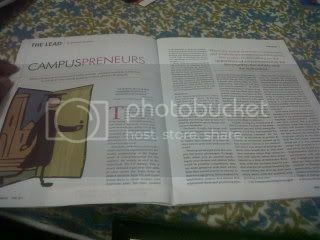 I got my first assignment – An article on entrepreneurship!! Submitted the article on two days flat, and got a confirmation that the article has been accepted an would be the lead story in the april issue of the magazine. As promised, the magazine was couriered along with the cheque( YIPPEEE!!) last week. For the benefit of the BRAToSPHERites, I am publishing the article here. This and many similar stories have become more and more common with each passing year, and the number of students opting for entrepreneurship is only headed upwards. Every year, more students are opting out of the comfort of campus placements, and venturing out to set up their own enterprises. Campuspreneurs, as they are commonly called, has become an everyday buzzword. Seminars, conferences and workshops are being organised across the world, emphasising on the importance of entrepreneurship for the country, the society as well as the individual. The US startup, Visa, a much debated legislation that aims to slow down the brain drain of skilled workers from US and incentivises them to create startups (and American jobs), has been updated to be friendlier to H1B visa holders as well as foreign students studying in the US. Every government has now realised that entrepreneurship alone would help in boosting the economy, and bring in the much required growth. Every B-school campus worth its salt is looking for potential students who would create jobs for themselves and others rather than ask for a job at the end of their graduation. Today, entrepreneurship is regarded as one of the best development strategies for a country’s economic growth; it sustains the country’s competitiveness in facing the increasing demands of globalisation. With all this, India is already recognised as the land of a billion entrepreneurs the world over. In my entrepreneurial journey I have been asked many times, “Is this the right time of your career to be taking such a risk?” The answer is, yes. There is no better time than right now. Instead of wondering at the age of 50 what it could have been like, I will like to take this one chance to find out. Besides, there is nothing like starting out young. One is raw, fuelled by passion to prove things and set new standards. Facebook, Google, Microsoft and Apple, the biggest names in the corporate world, were all startups found by young students in their pursuit to follow their dreams. It is now India’s turn to give such leaders to the world. Starting out straight from the campus has many advantages. To begin with, when you go around speaking to your seniors and alumni (who could be possible competition), they are more generous with their advice than they would ever be to anyone in their own age group. When I asked my batchmates, seniors, and alumni that what made them quit promising jobs, or give up lucrative pre-placement offers and prompted them to take the proverbial plunge into uncertainty, I found one commonality in their replies; their definition of risk and their attitude towards it. An entrepreneurial ecosystem has been set up over the past two-three years across premier institutes. Incubators at IITs & IIMs have managed to give student entrepreneurs an access to early stage funding through grants from government departments, alongside venture capitalists, who are hunting for the next big ideas within college incubators. Funds such as VenturEast, Nexus Venture Partners, and SeedFund are increasingly backing companies from such college incubators. In 2008, during my second year at IIM (Lucknow), looking at the entrepreneurial zeal and drive among the students, a full day was reserved for “entrepreneurial ventures” for the first time in the history of premier B-schools, as companies queued up to hire summer interns at the institute. The move was aimed at helping students who would like to start their own ventures rather than accept offers with salaries below their expectations in a time of meltdown. Even now, with the economy back to normal and the job market booming like never before, the start-up days have many takers with the numbers only growing every year. Many say that entrepreneurs are born not created. But everything needs polishing and this is what good education does to an individual. The context changes the perspectives; entrepreneurship education has taken a huge leap towards achieving this. It has moved on from its days of helping small and medium enterprises (there is the consulting club to do that), to setting up new-age incubators and helping in employment generation. Entrepreneurship education is now more in tune with broad innovation education. Even more striking than the vast increase in the entrepreneurial activity levels is the practical approach to teaching entrepreneurship. Professors have realised that a good entrepreneur needs not know various models, and theories behind it, but should gain more knowledge about the finer aspects like hiring the first employee, setting up the office, getting the first client, and making a brand out of it. The students are no longer kept trapped in a classroom and led by the faculty alone. 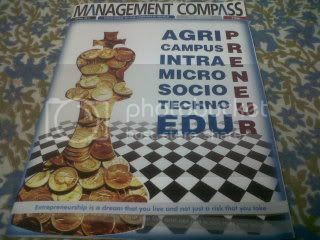 The entrepreneurship elective is no longer synonymous with only commerce and management literature. In fact, there are many institutes like Xavier Institute of Management and Entrepreneurship, which offer two year courses in entrepreneurship. Nurture Talent, a startup by an IIM alumnus, is also into the field of entrepreneurial education. There are many more executive programs provided by management institutes related to training people in management education. The higher the risk, the higher the benefit. This is the basic statement by which any investment is decided, any action is calculated & any activity is pursued. This is the fundamental truth of management, and anything related to do with it. There is no doubt that giving up the certainty of a monthly cheque and job security is a major risk. But then, so is taking up a 20 year home loan with the belief of a steady income for the next twenty years. As a rational human being, one should not just calculate the risk in taking the entrepreneurial step, but should also calculate the risk of not taking the risk at all. Realising that many students fear venturing out on their own, and instead take the comfort in opting for campus placements, the IITs, IIMs and many other premier B-schools have come up with the concept of deferred placements wherein a student can opt out of the placement, start his own venture and can appear for the placement process anytime in the next two to three years (the number of “cushion” years varies from B-school to B-school). In the last few years, entrepreneurship has started gaining acceptance from the society. The social taboo is diminishing and failed startups are no more looked down upon. These days, family, friends and the society at large, including potential employers are more welcoming towards people who have tried setting up an enterprise. The E word is in! With the older generations, securing a government job was considered to be the best way to retire in peace – you join a company, grow through the bureaucracy and then retire with the promise of a handsome pension. In the present capitalistic world, this kind of culture does not exist. Darwin could not have been more correct in saying “survival of the fittest”. Companies that follow their American counterparts just believe in HIRE AND FIRE. And rightly so, we are all here to make profits, aren’t we? It is the NGOs that are there for charity. With the economic uncertainty rising, job security is as uncertain as the assured success of any startup. Who knows what will be your job profile tomorrow? Or, who will be your boss in the future? There may be a hundred reasons to quit a job, but your employer will surely have a thousand more reasons to fire you. These reasons have fostered ideas in the minds of the youth to create opportunities and capitalise on them. Now-a-days, most parents (I would not say all yet) do not complain if their child walks out of a premier B-school to pursue a personal project from his/her engineering days and dreams big from the very beginning. For example, one of my seniors from IIM Lucknow dropped out 3 months after joining the campus, and now he has the opportunity to fly – he makes engines for Hero Honda, develops Unmanned Arial Vehicles (UAVs)! Most companies face failures initially. It’s an unsettling fact for the student entrepreneurs, but old news for start-up veterans. But the good news is that running a failing company may actually help a career, but only if the entrepreneur is willing to view failure as a potential area for improvement. As a parting note, I would like to propagate a thought that our mentor once shared with us – “You become an entrepreneur by choice, and not because you are not doing well professionally”. Very well written. Congratulation ! ur name is on national magazine. BTW r u quitting the chocolate company ? @ Praveen: thank you so much!!! All the very Best for your future Projects. Murthy Garu, Thank you so much!!! @ Prakash: thnk u so much bro!! !